DIE Jovis, videlicet, 16 die Junii. E. of Bolingbrooke to put the Bedfordshire Militia in Execution. E. of Bedford. and E. of Portland. Letter from Lord Howard at York, desiring to be recalled. Message to the H. C. to sit P. M.
Letter from Lord Spencer, about the Northampton Militia and Voluntiers. Letter from the Earl of Stamford, about the Leicestershire Militia. Message from the H. C. with Instructions about raising Horse, Money, &c.
for such A coutrements, &c. as can be spared from Hull to be sent up. Adventurers Ships to be sent to Ireland. Message from the H. C. to impeach the Nine Lords at York. Message from the H. C. for a Conference about the Treaty with the Scots. Impeachment sent to the Nine Lords, and they to answer it. Post-warrant, for the Messenger that carries the Impeachment. Instructions about the Propositions for raising Money, Horse, &c.
Articles of impeachment against Nine Lordsat York. Order for the impeached Lords to answer. Ordered, That the Earl of Bollingbrooke hath Leave to go into Bedfordshire, to put into Execution the Militia. A Letter was read, written from the Lord Howard, from Yorke, directed to the Speaker of the House of Peers for the Time being. Ordered, That the Cause which concerns the Earl of Bedford and the Earl of Portland, touching the , shall (fn. 2) be deferred till the next Term; and then to have a Trial (fn. 3) at Law, for which their Lordships will wave their Privileges. Yorke, the 13th of June, 1642. The Lords proceeded in the Cause of the Lord St. Johns, against George Benyon; and the Parties and Counsel on both Sides. And Mr. Glyn desired, "That, as Mr. Benyon's Counsel did the last Day (fn. 4) produce some Witnesses to discredit some of the Lord St. John's Witnesses; now they desired that they might be allowed to produce some Witnesses to prove how Mr. Benyon hath tampered with Witnesses, to withdraw their Testimonies from the Lord St. Johns." And Mr. Benyon's Counsel desired the Judgement of the Lords herein. 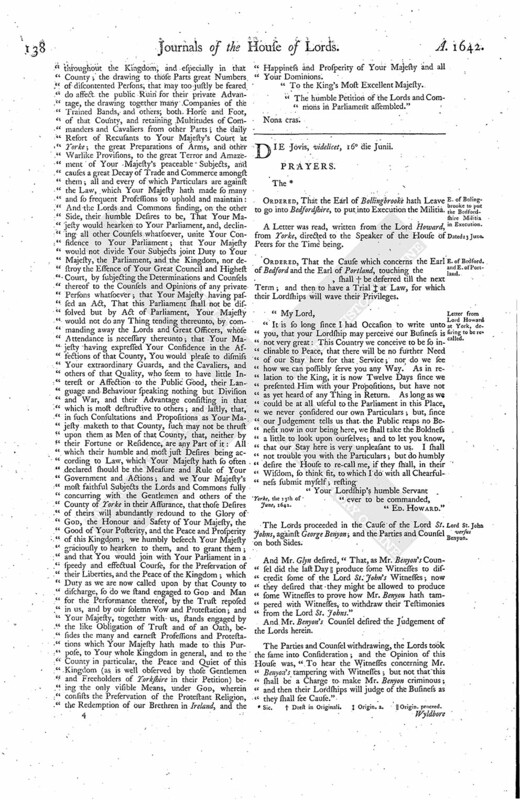 The Parties and Counsel withdrawing, the Lords took the same into Consideration; and the Opinion of this House was, "To hear the Witnesses concerning Mr. Benyon's tampering with Witnesses; but not that this shall be a Charge to make Mr. Benyon criminous; and then their Lordships will judge of the Business as they shall see Cause." Wyldbore said, "He met Mr. Benyon about August last, and he carried him to a Tavern, and told him he heard he was to be a Witness against him concerning the Lord St. John's Cause; and he would have had him protested, before Almighty God, that he knew no Injury done by Mr. Benyon to any Lord." John Stevens said, "That Mr. Benyon told him at his Shop, he had a Desire to have a Meeting with him and Wildbore, and make an End with Wilbore concerning the Lord St. Johns; and that Mr. Benyon told him he had One Hundred Pounds ready for him, if he would stand for him, and deny what he knew concerning the Wrong which he hath done to the Lord St. Johns and other Lords, and take off Wildbore." "That Mr. Benyon bought a Receiver's Place of the Counties of Rutland and North'ton for Fifteen Hundred Pounds; and 14 July, 7° Caroli, entered into a Bond to make a just and true Accompt to the King before the 20th of January and 20th of July." The Counsel of Mr. Benyon alledged, "That the Charge concerning this was so general, that no Defence could be made to it; and desired it might be made particular, beside the Charge of the Lord St. Johns." The Lord St. John's Counsel alledged, " That there was an Agreement of a particular Charge of all the Debts assigned over to the King, by Benyon; to which Mr. Benyon consented, to go upon them." Mr. Benyon denied any such Consent. "That Three Thousand Pounds was assigned over to the King, by Deed, the 2d of July, 15 Caroli, being the Lord St. John's Debt. At that Time, Mr. Benyon was not so much indebted to the King. "One Hundred Ninety-nine Pounds, Eight Shillings, Mr. Benyon was indebted to the King, 15 Caroli, as by the Foot of the Accompt it appeared." One Robert Hall, upon Oath, deposed, "That this Morning he heard Mr. Benyon speak to Mr. Butler, a Witness of the Lord St. Johns, and bid him be gone, if ever he would do him a Pleasure." Butler said, "He did not speak with Mr. Benyon this Morning." Mr. Benyon's Counsel said, "That Auditor Phillips is able to prove and make it appear, that the Debt owing to the King by Mr. Benyon's Accompt is Ten Thousand Pounds." The Parties and their Counsel withdrew. Ordered, That this House shall sit this Afternoon, at Three a Clock. To let them know, that this House intends to sit at Three a Clock this Afternoon, and desire them to sit (fn. 5) like. A Letter from the Lord Spencer was read. "For the Right Honourable the Earl of Leicester, Lord Lieutenant of Ireland. "That the County of Leycester did obey the Militia chearfully, and many Voluntiers came in. "That the Earl of Huntington and Earl of Devon, &c. have a Commission of Array for the County of Leycester, (fn. 7) and his Lordship desired to know what to do if it should be put into Execution; and he will observe their Lordships Commands." Ordered, That, unless the Earl of Stamford know a certain Time when the Militia will be executed, that he repair hither; and that the Votes of this House declaring the Commissions of Lieutenants to be illegal shall be published in that County. Ordered, To be considered of further To-morrow. Ordered, That the Witnesses shall be sworn by the Clerk of the Parliament on the Behalf of Freshfeild, whose Cause is referred to the Consideration of Justice Reeves. Ordered, That the Petition of Halsal is referred to the Committee appointed to examine the Business concerning the publishing of the Proclamation against the Militia. Ordered, That Robins is referred to take his Course in Law. "1. (fn. 8) To present Instructions concerning the Propositions concerning the raising of Horse for the Defence of the King and Kingdom." Agreed to in the general, and afterwards to consider to what Counties to send to, for bringing in Horses. "2. Resolved, by the House of Commons, That Captain Burrell, Tho. Lloyd, Gentleman, John Smith, and Francis Dowett, of London, Gentleman, are approved, to be Commissaries, to inroll and value the Horse and Arms, to be raised according to the Propositions." "3. That the Lords be moved, to join with the House of Commons, in an Order, That so many of the Saddles and Horse Arms, and other Ammunition, as may conveniently be spared out of the Magazine at Hull, be forthwith sent to London; and that the Lord Admiral be desired to provide Ships for the bringing it hither." Ordered, That this House agrees with the House of Commons, That all the Horse Arms (excepting Arms for Three Hundred Horse) shall be brought away from Hull to London; and so much Powder and other Ammunition as Sir Jo. Hotham thinks it fit to be spared; and that Sir John Hotham shall have the same Power for providing of Ships as formerly he had; and that the Lord Admiral shall provide Shipping to convoy the same to London. Resolved, That this House agrees with the House of Commons in these Alterations. 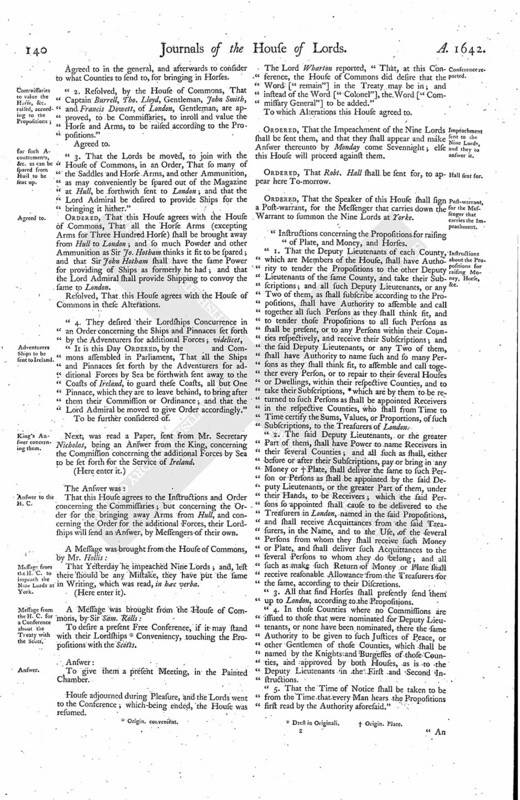 "It is this Day Ordered, by the and Commons assembled in Parliament, That all the Ships and Pinnaces set forth by the Adventurers for additional Forces by Sea be forthwith sent away to the Coasts of Ireland, to guard these Coasts, all but One Pinnace, which they are to leave behind, to bring after them their Commission or Ordinance; and that the Lord Admiral be moved to give Order accordingly." To be further considered of. Next, was read a Paper, sent from Mr. Secretary Nicholas, being an Answer from the King, concerning the Commission concerning the additional Forces by Sea to be set forth for the Service of Ireland. That this House agrees to the Instructions and Order concerning the Commissaries; but concerning the Order for the bringing away Arms from Hull, and concerning the Order for the additional Forces, their Lordships will send an Answer, by Messengers of their own. That Yesterday he impeached Nine Lords; and, lest there should be any Mistake, they have put the same in Writing, which was read, in bæc verba. To desire a present Free Conference, if it may stand with their Lordships (fn. 9) Conveniency, touching the Propositions with the Scotts. To give them a present Meeting, in the Painted Chamber. The Lord Wharton reported, "That, at this Conference, the House of Commons did desire that the Word ["remain"] in the Treaty may be in; and instead of the Word ["Colonel"], the Word ["Commissary General"] to be added." To which Alterations this House agreed to. Ordered, That the Impeachment of the Nine Lords shall be sent them, and that they shall appear and make Answer thereunto by Monday come Sevennight; else this House will proceed against them. Ordered, That Robt. Hall shall be sent for, to appear here To-morrow. Ordered, That the Speaker of this House shall sign a Post-warrant, for the Messenger that carries down the Warrant to summon the Nine Lords at Yorke. "Instructions concerning the Propositions for raising of Plate, and Money, and Horses. 1. That the Deputy Lieutenants of each County, which are Members of the House, shall have Authority to tender the Propositions to the other Deputy Lieutenants of the same County, and take their Subscriptions; and all such Deputy Lieutenants, or any Two of them, as shall subscribe according to the Propositions, shall have Authority to assemble and call together all such Persons as they shall think fit, and to tender those Propositions to all such Persons as shall be present, or to any Persons within their Counties respectively, and receive their Subscriptions; and the said Deputy Lieutenants, or any Two of them, shall have Authority to name such and so many Persons as they shall think fit, to assemble and call together every Person, or to repair to their several Houses or Dwellings, within their respective Counties, and to take their Subscriptions, (fn. 10) which are by them to be returned to such Persons as shall be appointed Receivers in the respective Counties, who shall from Time to Time certify the Sums, Values, or Proportions, of such Subscriptions, to the Treasurers of London. "2. The said Deputy Lieutenants, or the greater Part of them, shall have Power to name Receivers in their several Counties; and all such as shall, either before or after their Subscriptions, pay or bring in any Money or (fn. 11) Plate, shall deliver the same to such Person or Persons as shall be appointed by the said Deputy Lieutenants, or the greater Part of them, under their Hands, to be Receivers; which the said Persons so appointed shall cause to be delivered to the Treasurers in London, named in the said Propositions, and shall receive Acquittances from the said Treasurers, in the Name, and to the Use, of the several Persons from whom they shall receive such Money or Plate, and shall deliver such Acquittances to the several Persons to whom they do belong; and all such as make such Return of Money or Plate shall receive reasonable Allowance from the Treasurers for the same, according to their Discretions. "3. All that find Horses shall presently send them up to London, according to the Propositions. "4. 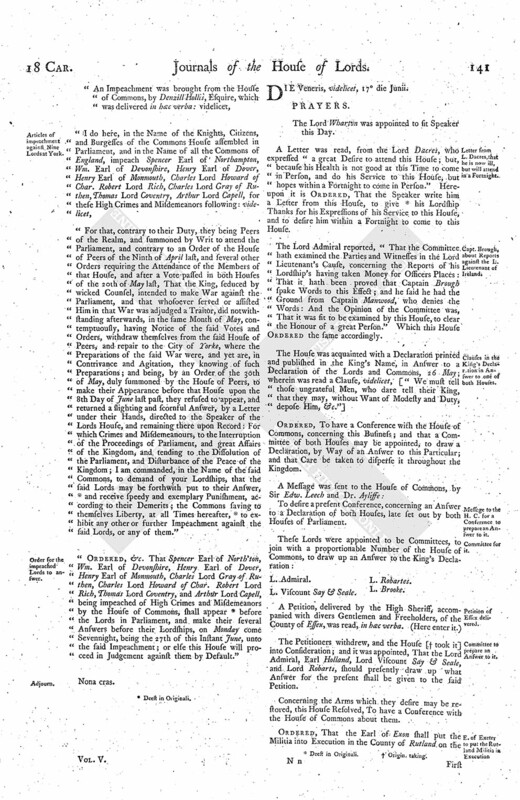 In those Counties where no Commissions are issued to those that were nominated for Deputy Lieutenants, or none have been nominated, there the same Authority to be given to such Justices of Peace, or other Gentlemen of those Counties, which shall be named by the Knights and Burgesses of those Counties, and approved by both Houses, as is to the Deputy Lieutenants in the First and Second Instructions. "5. That the Time of Notice shall be taken to be from the Time that every Man hears the Propositions first read by the Authority aforesaid." 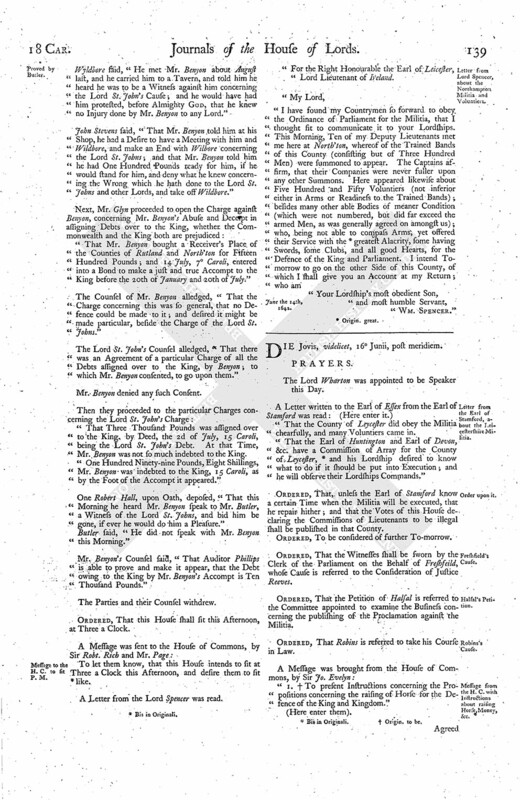 "For that, contrary to their Duty, they being Peers of the Realm, and summoned by Writ to attend the Parliament, and contrary to an Order of the House of Peers of the Ninth of April last, and several other Orders requiring the Attendance of the Members of that House, and after a Vote passed in both Houses of the 20th of May last, That the King, seduced by wicked Counsel, intended to make War against the Parliament, and that whosoever served or assisted Him in that War was adjudged a Traitor, did notwithstanding afterwards, in the same Month of May, contemptuously, having Notice of the said Votes and Orders, withdraw themselves from the said House of Peers, and repair to the City of Yorke, where the Preparations of the said War were, and yet are, in Contrivance and Agitation, they knowing of such Preparations; and being, by an Order of the 30th of May, duly summoned by the House of Peers, to make their Appearance before that House upon the 8th Day of June last past, they refused to appear, and returned a slighting and scornful Answer, by a Letter under their Hands, directed to the Speaker of the Lords House, and remaining there upon Record: For which Crimes and Misdemeanours, to the Interruption of the Proceedings of Parliament, and great Affairs of the Kingdom, and tending to the Dissolution of the Parliament, and Disturbance of the Peace of the Kingdom; I am commanded, in the Name of the said Commons, to demand of your Lordships, that the said Lords may be forthwith put to their Answer, (fn. 12) and receive speedy and exemplary Punishment, according to their Demerits; the Commons saving to themselves Liberty, at all Times hereafter, (fn. 12) to exhibit any other or further Impeachment against the said Lords, or any of them." "Ordered, &c. That Spencer Earl of North'ton, Wm. Earl of Devonshire, Henry Earl of Dover, Henry Earl of Monmouth, Charles Lord Gray of Ruthen, Charles Lord Howard of Char. Robert Lord Rich, Thomas Lord Coventry, and Arthur Lord Capell, being impeached of High Crimes and Misdemeanors by the House of Commons, shall appear (fn. 12) before the Lords in Parliament, and make their several Answers before their Lordships, on Monday come Sevennight, being the 27th of this Instant June, unto the said Impeachment; or else this House will proceed in Judgement against them by Default."